Challenges yet remain for deaf people in the United States in securing access to critical services such as education, medical care, and legal representation through American Sign Language. Although there are barriers to overcome before it would be ratified by the United States, the Convention on the Rights of People with Disabilities holds promise as a means to accomplish this long awaited goal. The United Nations developed and adopted the Convention on the Rights of Persons with Disabilities (“CRPD”) to advance equality further throughout the world. Persons with disabilities were extensively involved throughout this process. A “Convention” is an international treaty or an agreement. If a country ratifies this treaty, the country becomes obligated to implement rights spelled out in the treaty, such as protecting the human rights of individuals with disabilities. This Convention encompasses critical activities that create quality in living, encompassing employment, education, health care, transportation, legal and social justice, communication, and recreation. The CRPD follows other UN Conventions in that it recognizes the importance of preserving and promoting the language and culture of minority people. The CRPD is unique in that it is the first Convention which includes deaf people as one such minority. Specifically, it recognizes the cultural and linguistic identity of deaf people who use sign language and acknowledges that teachers of deaf students should be trained and proficient in sign language. Further, the treaty specifies that deaf children have the right to be educated in environments that maximize both educational and social advancement. Country members of the United Nations can signal their commitment to the CRPD in their country by signing and ratifying the CRPD. 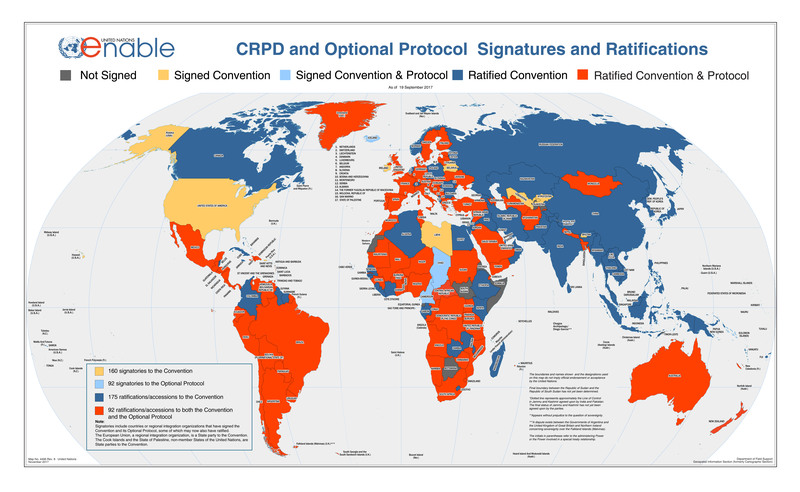 As of April 2012, there were 153 signatories to the treaty, including the United States, which signed on the CRPD on July 30th, 2009. Signature of the CRPD signifies support for it but does not obligate compliance with its specific articles. Ratification legally binds a country to the specific articles of the treaty. One hundred and twelve (112) countries have ratified the CRPD, but as of this writing the United States has not. For the United States to ratify the CRPD, the Administration has to submit the CRPD to the U.S. Senate, which did happen on May 17, 2012. The Senate then has to approve the resolution for ratification by a two-thirds vote. After this process is completed, the U.S. government would be formally obligated to uphold the principles expressed in the CRPD and ensure that disability rights laws such as the Americans with Disabilities Act are appropriately enforced. “Facilitating the learning of sign language and the promotion of the linguistic identity of the deaf community”. . .
“Ensuring that the education of persons, and in particular children, who are blind, deaf or deafblind, is delivered in the most appropriate languages and modes and means of communication for the individual, and in environments which maximize academic and social development.” . . . If the CRPD were to be ratified by the United States, the strong recognition of the CRPD for sign language and deaf culture may become another tool for deaf advocates. For example, advocates may have greater support to require that deaf children be taught by qualified teachers fluent in sign language, and to promote policies for the provision of qualified sign language interpreters in a variety of critical settings. However, the United States has not ratified any international human rights treaty since 2002. A significant effort from the entire deaf and hard of hearing community with its partners in the disability community as well as all allies must be made to push the CRPD through the Senate. The National Association of the Deaf is appreciative and grateful that on May 17, 2012, the Obama Administration sent the CRPD treaty package to the U.S. Senate for ratification. Now that the Senate has received the CRPD package, the National Association of the Deaf is collaborating with the United States International Council on Disabilities and other partners in the broader community to ensure that every appropriate means is pursued to advance this important ratification, including model letters for all individuals and organizations to use to contact their Senators. Other advocacy organizations that are also invested and involved in this process are the World Federation of the Deaf and theU.S. International Council on Disabilities (USICD). This position statement was prepared by the Civil Rights Subcommittee of the Public Policy Committee, and approved in April 2012 by the NAD Board of Directors, with updates in May 2012.